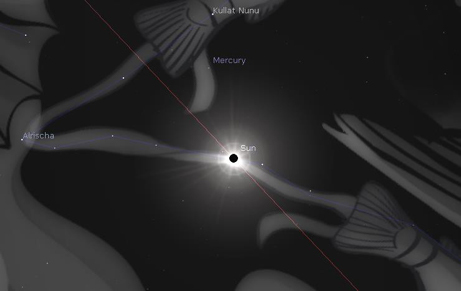 A lot of material has been written and published on the great American Solar Eclipse this Monday August 21, 2017. Some say there will be great judgment and catastrophe such as earthquakes, riots, or civil war, others expect a great harvest of souls. How is it that the same event can cause such differing interpretation? Didn’t Jesus say of the elite of His time that they could discern the signs in the sky, but they struggled to understand him (Matt 16:1-4)? How come we think we know Jesus so well, but don’t understand the signs in the heaven? So the luminaries were made for the sake of time keeping. It is as if God says: “Look at them and you know about my times and seasons!” So how come the Jewish Rabbis of the 1st century (Matt 16), as well as the Eastern stargazers (Matt 2), knew how to discern the heavens and we don’t even have that basic understanding anymore? The Lord stated that even the nations that did not know Him, knew how to read the signs of the heavenly bodies. The difference between Israel and the nations was not that one paid attention to the heavens and the others didn’t. The main difference was that the Gentile nations got frightened by what they saw and God never wanted His people to be frightened by anything they encounter. King Darius of Persia said in Daniel 6:27 that God’s miraculous works of deliverance and rescue are connected to signs and wonders in the heaven. He wrote that after he had a personal encounter with the God who saved Daniel out of the lions’ den. In other words, he wasn’t ignorant anymore that the Creator of the heavens had good intentions with His people. The path of the Sun crosses 12 states and the entire continental US beginning with Oregon, Idaho, Montana, Wyoming, Nebraska, Kansas, Missouri, Illinois, Kentucky, Tennessee, North Carolina, and finally South Carolina. 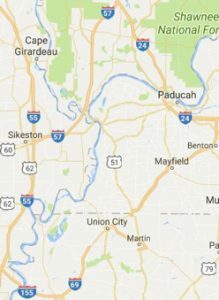 The point of the greatest eclipse was the Sun, Moon and Earth are in perfect alignment will be somewhere in Kentucky in the area enclosed by routes 57 in the north, 24 in the east, 69 and 155 in the south, and 55 in the west. Turning our focus from highways to railroads, there are two major railways going through a small town called Union City, which got its name from the fact that the tracks unified there. Another unification happens in this area as the Ohio flows into the Mississippi. Ohio means the ‘good river’ and Mississippi is the ‘great river’. This great river is made up of many streams! Many smaller rivers feed into the Mississippi and ultimately it becomes the largest river in our country. Likewise, the river that flows right out of the throne of God will make glad His people as they rejoice in renewed, refreshed and purified life. This is what will happen in this coming season! Get ready to receive God’s Great River and do not let His next move that is about to happen shortly pass you by! 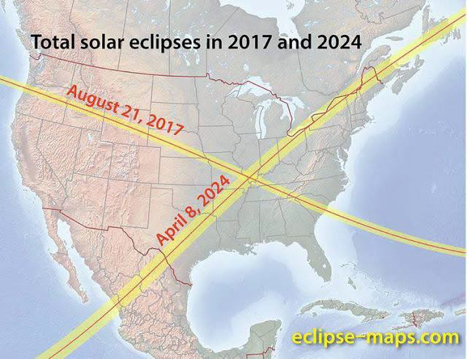 This is exactly the same area where the path of the Sun will cross once more in the next total solar eclipse in the continental US on 4/8/2024 forming a beautiful cross over the entire nation. It seems very likely that this area will be under God’s special attention. Listen to what the highways, the railroads, the rivers, the Sun, and the Moon are saying! There is going to be another great move of God coming upon us. It will be unlike anything that has ever happened before. It will be marked by the supernatural unity that is based on the finished work of the Cross. When looking down upon the earth it looks like God has marked the US for something special using His black ink pen of the path of the Sun. This is an absolutely rare event that hasn’t happened ever in the history of the United States or the history of another nation in a similar fashion. One thing God is certainly saying is that the seven year period marked by those two events is very special to Him. Back in 2010, the Lord showed me that the church was headed for two periods of seven years that would be very different from each other. The first one would be a time of extreme blessing and increase and the bringing in of the first portion of the Great Harvest, while the second period would be marked by a lot more persecution, natural disasters, and the second even larger phase of the Great Harvest. The first of these two-time frames began with the last election where we received a God fearing, a patriotic president that loves our nation and does everything to protect us from onslaughts of a globalist atheistic world order. These first seven years will be marked by both terms of his presidency which will see major revival happen not only in America but also in many other nations. Remember, God, rebuked Israel for being afraid at the signs in the sky! 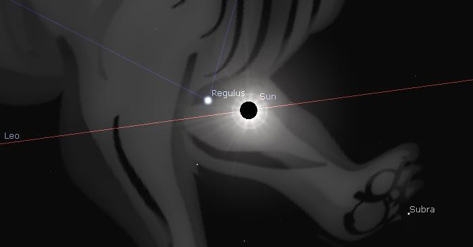 This is the picture of an almost perfect conjunction between Sun, Moon, and the star Regulus. Regulus is the main star of the constellation Leo (the Lion), which is the 12th constellation in the ancient Semitic counting of the path of the Sun in the Sky (called ecliptic). In other words, there are two paths of the sky: One on earth and one through the constellations of the Mazzaroth (hebr. signs). Please note that the elder here says: “Do not weep!” There is no reason to be afraid of the future! Jesus has overcome and He’s getting ready to open a scroll, a book containing a new revelation, a new message that is in line with what was revealed about Him in the past, but it’ll provide a new and deeper understanding of His ways and secrets. God loves to hide things for some time, only for His people to eventually figure things out and enjoy the thrill of the treasure hunt (Prov 25:2). The name Regulus is Latin and means “the little king” or prince. Jesus is that Prince of Peace (Is 9:6) who will in this coming season crush Satan under the feet of the church (Rom 16:20). In ancient times Regulus was considered a star that stood for financial breakthroughs and business success. “Get ready for a time of great exploits, of deeper and more powerful revelation of the unfathomable wisdom of God. A time is starting where the church will not only reflect the Jesus who is the Suffering Servant and Slain Lamb, but this time the Jesus who is the Ruler of Peace, Crusher of satanic strongholds and the Lord of all Silver and Gold. Where people were not able to find peace from demonic oppression, they will now get access to that blessing. Emotional and rational strongholds will be taken down more easily than ever before. And those that have been seeking to break out of debt and cycles of lack, will do so, even though the world tells you that nothing has changed and reminds you of the failures of the past. This coming season will be different. Those who believe will be the first to receive. Those who doubt will see others being blessed and start growing in faith as well until this becomes a flood wave of the people of God having breakthroughs. This time there is no particularly bright star near the conjunction of Sun and Moon. The two of them much rather reside in the area of the sky called Pisces or the constellation of the Fishes. It is that band of love (Hos 11:4) that connects the two fishes. Jewish and Gentile believers will become One New Man. The name of that Man is Jesus Christ. His body on earth will be ready for the head to come from heaven. Paul teaches that before the end comes both Jews and Gentiles will experience a great revival and unprecedented measures of salvation. (Rom 11:25-26). The stars that make up the constellation of the fishes are all not very bright and none of them really outshines the others, so will be the body of Christ. In the time ahead there will not be those lonely and few spiritual supermen who seem to outshine everyone else. Instead, there will be an innumerable amount of nameless, faceless believers, full of humility, unity, and peace, this will finally enable Christ to shine like the Sun in our midst. And don’t forget: Whatever may happen to you and your family on a personal level, don’t be afraid like those that don’t know Jesus. Lift up your eyes to Him who was and is and always will be our only source of hope, peace, and love.